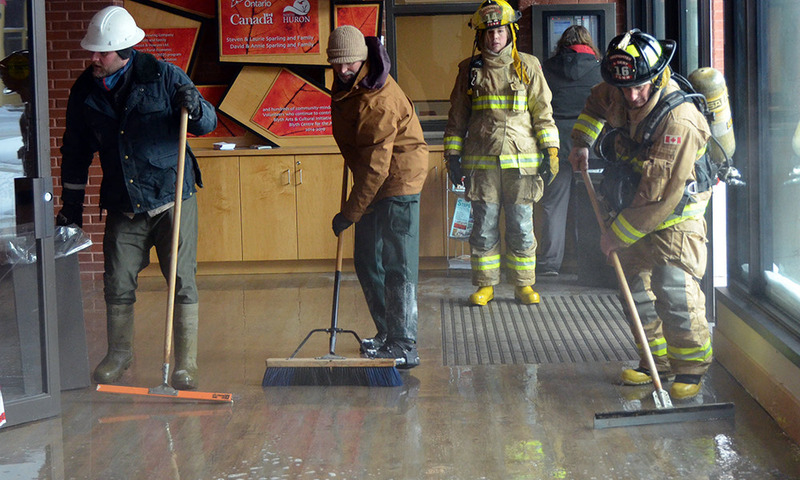 A broken pipe in the sprinkler system at Blyth Memorial Hall led to an evacuation of the building last Friday and may result in some damage to the facility. The assumption among those at Memorial Hall is that the pipe, located at the back of the Bainton Gallery, froze and broke, resulting in water flooding into the room. The flooding was isolated to the room and the TCC Link at the east entrance of the structure where firefighters later directed water outside. A chemical designed to prevent freezing was in the water and the chemical has a similar odour to gas, which is what prompted the evacuation of the building. Members of the Fire Department of North Huron were on scene on Friday, first shutting off utilities to the building to make sure the issue wasn’t further complicated, then verifying there wasn’t a gas leak. 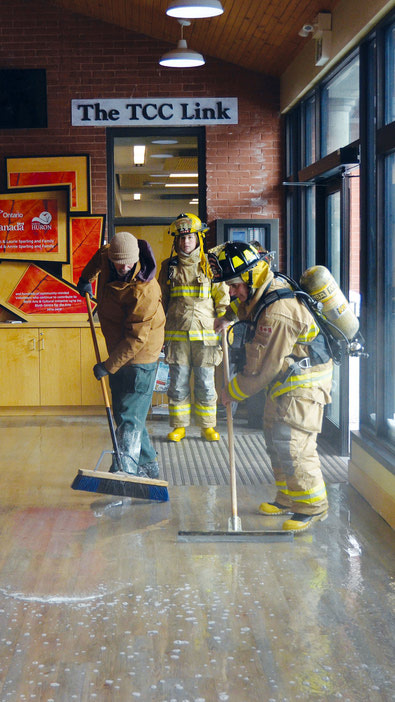 Finally, the firefighters, alongside other volunteers, grabbed brooms and squeegees and started clearing water from the site in hopes of preventing damage to the municipally-owned structure. While no major problems were immediately visible, the floor and drywall may need replacing, a Memorial Hall representative said, despite dehumidifiers and fans running non-stop all weekend. Huron-Bruce MPP Lisa Thompson was hosting an agricultural roundtable at the site, which was moved to Blyth Cowbell Brewing Company. The Blyth Festival office was also evacuated. Audience Services Manager and Volunteer Coordinator Lisa Harper explained that the flooding occurred on the organization’s first day of ticket sales for members, though she said it had little impact on the day.